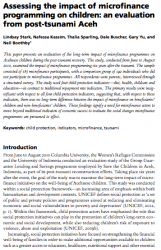 This paper, published in Disasters, presents an evaluation of the long-term impact of microfinance programmes on Acehnese children during the post-tsunami recovery. The study, conducted from June to August 2010, examined the impact of microfinance programming six years after the tsunami. The sample consisted of 185 microfinance participants, with a comparison group of 192 individuals who did not participate in microfinance programmes. All respondents were parents, interviewed through a structured survey. The study used four child protection indicators—diet, health, childcare and education—in contrast to traditional repayment rate indicators. The primary results were insignificant with respect to all four child protection indicators, suggesting that, with respect to these indicators, there was no long-term difference between the impact of microfinance on beneficiaries’ children and non-beneficiaries’ children. These findings signify a need for microfinance actors to move beyond traditional indicators of economic success to evaluate the social changes microfinance programmes are presumed to effect.